Our advanced security surveillance systems and fully trained personnel provide you with protection and peace of mind. Safety Net Security offers round-the-clock monitoring of your home and business using an ULC listed monitoring station. Our trained security monitoring personnel provide service in English with a majority of staff also providing service in French, Cantonese or Mandarin. Our monitoring stations are located in Vancouver, Toronto, Ottawa and Quebec City. Our fully redundant security surveillance systems ensure all alarms are responded to in the timeliest manner. We provide security monitoring by both telephone and cellular phone back-up. Two way voice communication is also available. Trained dispatchers follow your instructions on reacting to alarms. We can also provide alarm responders to attend in the event of an alarm. 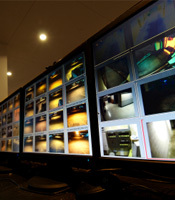 We will monitor your CCTV system as well, either continually or upon an alarm being triggered. You have the ability to use a one-touch button to notify police or fire. If your smoke alarm is activated when you are not there, the fire department is automatically notified.